Lunch will be provided immediately after the workshop. Does digital emergence inevitably translate into analog marginality? Do physical objects have the right to exist? This talk assesses the inconvenient persistence of physical objects and suggests that the inconvenient affordances of materiality help us defamiliarize the digital turn and perhaps address historical injustices. Rick Prelinger, Professor of Film & Digital Media at UC Santa Cruz, is an archivist, writer and filmmaker. His archives of 60,000 “useful cinema” films were acquired by Library of Congress in 2002; he now collects home movies and personal media. With Internet Archive, he built an open-access online repository of historical films beginning in 2000 which now totals 7,000 freely reusable films. His films include the archival feature Panorama Ephemera (2004), which played in venues around the world, and No More Road Trips?, which received a Creative Capital grant in 2012. His Lost Landscapes participatory urban history projects have played to many thousands of viewers in San Francisco, Detroit, Oakland, Los Angeles and elsewhere. He is a board member of Internet Archive and frequently writes and speaks on the future of archives and issues relating to archival access and futures. With Megan Prelinger, he co-founded and co-directs an experimental research library located in downtown San Francisco. Tien-Tien Jong, PhD candidate in Cinema and Media Studies will serve as discussant. In Mbembe’s critique of Bahktin, a carnivalesque critique of authority is rendered benign if that authority encourages and participates in blatantly grotesque appetites and flaunts its own vulgarity. This critique has particular relevance for current forms of comedic resistance to the Trump regime, a regime built upon its political immunity to the continuous exposure of Trump’s destructive appetites: no one undermines Trump quite as well as he undermines himself. This paper is interested in theorizing a new performative mechanism by which to resist authority and denounce totalitarian regimes through tactical, comedic display. With the aid of two infrequently paired essays of Walter Benjamin and the paradigm of comedic resistance modeled by Powell and Pressburger’s film adaptation of Tales of Hoffmann, this paper suggests that “puppet-hood,” or more explicitly the enunciation “I’m the puppet,” can offer us performative tool to combat Trump’s resistance to foreignness, refusal of access, and remoteness of meaning embedded in his political rhetoric. To uphold the rhetorical thrust of Trump’s notorious “Not a puppet” non-responsive response has political implications that can be exploited for opposite and oppositional ends. 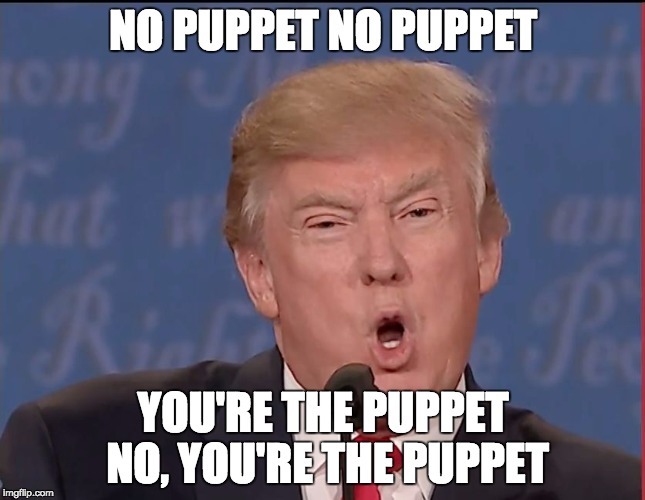 To exclaim “I’m the puppet” is to promise the existence of an expressive and therefore self-possessed self, relegated behind the scenes, behind the wall, and therefore to emphatically deny authority access to this self within a political sphere that increasingly denies human rights to its subjects-made-puppet. Marissa Fenley is a PhD student in the joint program in English and Theater & Performance Studies. She works at the intersections between literary and theatrical modernism, particularly around issues of perception and spectatorship. 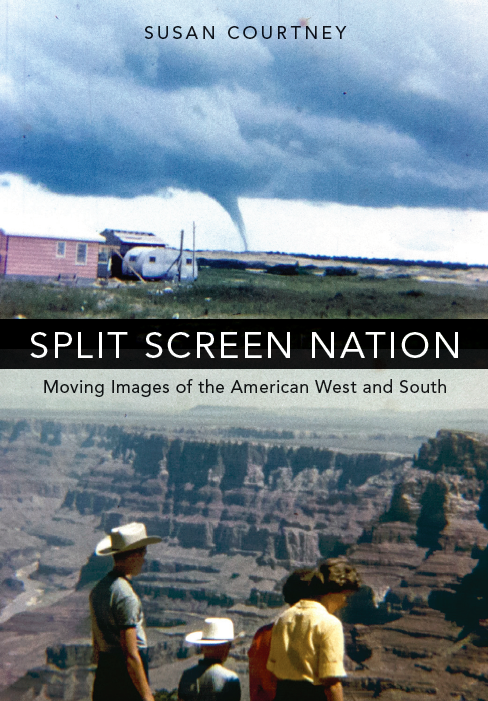 I’m circulating the opening chapters of my new book, Split Screen Nation: Moving Images of the American West and South. An intersectional study of orphaned and popular screen media, this book investigates the history of divided feelings about the United States and its most paradoxical narratives through the lens of region. In the decades after World War II, it argues, such feelings animated a detectable opposition between the screen West and the screen South. Reading these vernacular screen forms in relation, the project aims to expand our understanding of their circulation across a diverse range of theatrical and non-theatrical material. Attentive to the diverse contexts of production and consumption at issue in its archive, Split Screen Nation does not jettison close analysis of audiovisual form, but rather by seeks to refine the kinds of historical insight we might extract with it. Since my talk at UC the day before the workshop will focus on my work on atomic test films, I thought it might be nice to invite folks to consider some of the larger questions the book engages, so I’m sharing the introduction and the first chapter. Also, since the book uses short sections I call “teasers” before these chapters, to invite readers to easily dip into, and travel around in, some of its key examples, I’ve included two of these as well to offer a glimpse of the range of materials the book considers. It might be nice to discuss the range interventions—methodological and otherwise—laid out in the introduction. I’ve included chapter one as more of a supplement (for any who may be interested) that lets you see how I engage amateur film. Susan Courtney is Professor of Film and Media Studies and English at the University of South Carolina, where she co-founded the Orphan Film Symposium. Her most recent book, Split Screen Nation: Moving Images of the American West and South (Oxford UP), came out earlier this year. Recent publications also include a series of guest columns in Flow: A Critical Forum on Media and Culture on teaching race and media studies today. Courtney is also the author of Hollywood Fantasies of Miscegenation: Spectacular Narratives of Gender and Race, 1903-1967 (Princeton UP). Hannah Frank, in her Ph. D. dissertation and the book that she was preparing before her untimely death, was pioneering a new way of exploring cinema by applying frame-based analysis to theatrical animation, that is, to classic Hollywood cartoons. Her efforts were aimed at breaking through the enduring familiarity of these works by revealing the micro-events, blemishes, errors and corrections that the filmmakers assumed to have been masked by the films’ passage through the projector at 24 fps. She insisted that animation was never cameraless, and that the animated image was just as indexical as any other cinematized image. Each frame is a photograph of an object in its real-world environment, whether as a mise-en-scene with humans, or puppets on a stage, or stacks of paper and cels on an animation stand. She contended that, “all animation—whether produced by a single artist, such as [Robert] Breer or [Ken] Jacobs, or at a major production studio, such as Universal or Warner Bros.—amounts to ‘single-frame cinematography.’” Quoting Eisenstein, she insisted on “a definition that ‘logically implies that animation and montage are equivalent, that they represent the same basic operation.’ And while most cartoons aim to soften the discontinuity between frames through the careful frame-by-frame reconstruction of animal and human locomotion, they sometimes deviate from that tendency—and quite radically” (dissertation, 40). This presentation is a demonstration of and inquiry into the analytic methods proposed by Frank. The subject is Swiss filmmaker Georges Schwizgebel (b. 1944). Schwizgebel’s work lends itself to this approach, not because they are commercial, neo-Hollywoodian cartoons, but on the contrary because they are hermetic, very dense visually, and crafted in extremely fine detail. In particular, he uses thick layers of paint, called impasto, for both the figures and the backgrounds, both of which often are repainted for every exposure. When in motion, this technique creates very complicated and ambiguous relationships between figure and ground, with the moving characters seeming to battle their way through a solid atmosphere of paint. Other techniques include creating dizzying movements that simulate a camera flying over landscapes and through spaces, often marked with deep shadows. Schwizgebel also refines the classic animation technique of cycling, that is, re-photographing the drawings or cels in a series to generate rhythmic, pulsing movement. For examples of his films, see Jeu and L’Homme sans ombre. The talk will concentrate on the filmmaker’s most recent work, The Battle of San Marco (2017). It is constructed with a spiraling-out “camera” movement that confronts the indigenous spatial issues within Paolo Ucello’s renaissance depiction of a furious battlefield. When viewed frame-by-frame, we can see the tensions between still and moving imagery, “mathematic” perspective and intuitive spatial representation, and an implicit battle between the painting’s foreground and background. 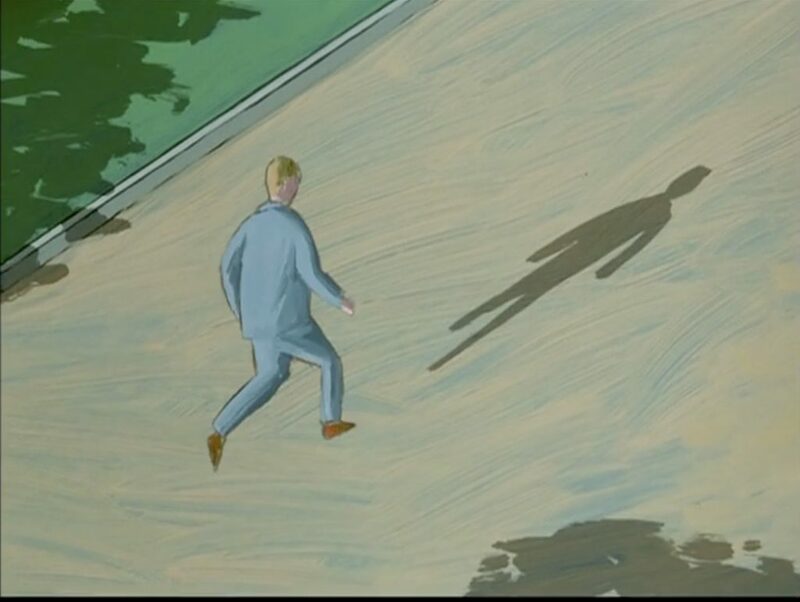 Furthermore, various pentimenti, that is, traces of underlying painting, reveal surprising additions by the animator that only appear when focusing on narrow areas of the picture and watching it in slow motion. Schwizgebel’s technique also creates temporal pentimenti, as the new layers of paint pile upon the previous ones to generate what Frank might have called “discontinuities between frames” that are partly intentional, partly accidental, yet always disruptive of the smooth flow of classic animation. Donald Crafton is the Joseph and Elizabeth Robbie Professor of Film, Television, and Theatre (Emeritus) at University of Notre Dame. He is the author of books on early French filmmaker Emile Cohl, on the transition from silent cinema to the talkies, and two landmark monographs on animation: Before Mickey: The Animated Film, 1898-1928, and Shadow of a Mouse: Performance, Belief, and World-Making in Animation. He is co-editor of The Moving Image, the journal of the Association of Moving Image Archivists.In 2001, the Academy of Motion Picture Arts and Sciences named him an inaugural Academy Film Scholar.